Despite the fact that Twilight Zone scared me witless, I watched it faithfully when I was a child. Perhaps I was trying to inoculate myself against the terrors of life. It didn’t work. One episode, entitled “Eye of the Beholder,” was especially frightening. The story revolves around a young woman who has just undergone plastic surgery to correct an ugliness that keeps her withdrawn from the world. We wait anxiously for the bandages to be removed, and, when they are taken off, we see that the woman is quite beautiful. It turns out that it’s the doctors, all aliens, who prove to be monstrous looking. Deeming the surgery a failure, they tell her she must go to another place (guess where) so she can be with her own kind. 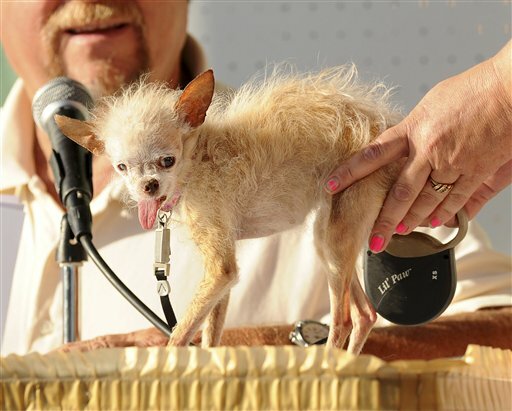 After I read yesterday about the passing of Yoda, the “World’s Ugliest Dog,” I got so frothy that this story had made headline news. Isn’t it enough, I asked myself, that we have to live in a culture that torments women who don’t conform to prevailing standards of beauty? Do we have to torture our girl dogs, too? When I sat down to give the world a piece of my mind, though, I took a close look at a photo of Yoda and recoiled in horror. She really WAS ugly, I thought. Alien ugly. I felt ashamed of my response because I love animals more than anything, except my daughter; yet, while it seems true that beauty is in the eye of the beholder, I am wondering now if there might be certain things in nature that make all of us draw back with the same primal fear. Take the lamprey whose mouth is ringed with teeth, whose tongue also has teeth on it, and who swims up inside the gills of fish to drain their blood. Actually, I don’t think Yoda is ugly…it is just a very old dog! We all lose our charms in the end…that’s a line from Diamond’s are a Girl’s best Friend, methinks…but very true. Seeing fragile Yoda, who was once a cute puppy, reminds us how we will lose our youghtful beauty and become that helpless old-age pensioner in a wheelchair one day…and I guess that’s why we are so put off by seeing little Yoda… most of our pets have such short life spans and their passing reminds us of our own mortality. I must look at a picture of that lamprey fish from the abyss though…even my tender-heartedness towards animals may fade away, when confronted with those rows of teeth! Yes, you are very right. I am an animal lover myself, which makes my response to poor Yoda a sad one.